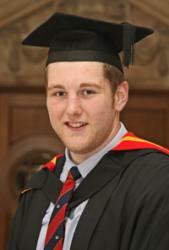 Ilan DaviesA talented engineer graduated from Bangor University after four years of hard work this week. As well as graduating with a MEng Electronic Engineering degree, Ilan Wyn Davies, 22, from Bala, Gwynedd also won the Dr John Robert Jones Prize of £1,000, which is awarded annually to the best students across all disciplines at the University. A former Ysgol Y Berwyn pupil, Ilan found out that he was dyslexic during his first year in the sixth form. This didn’t deter him from thinking about a university education, and whilst at a Bangor open day, the homely atmosphere, friendliness and the support available from the Miles Dyslexia Centre, ensured that Ilan made Bangor his firm choice. He then applied for and won a £1,500 Scholarship, which is awarded to those who achieve the highest academic attainment upon entry in the relevant subject areas. “I was a member of the The Welsh Society – Undeb Myfyrwyr Cymraeg Bangor, and enjoyed socialising and playing rugby. I took an active part in the Enterprise by Design Challenge, which brings students from different subjects together to compete in multi-disciplinary teams. I was part of the winning team in 2015 and facilitated the winning team in 2017. “During the summer of 2015 I spend 2 months on a summer placement at Y Wylfa on Anglesey, and in 2016 I gained a 3 month summer internship with Hitachi G.E. in Japan. “During my internship in Japan, I had the opportunity to climb Mount Fuji and to experience all aspects of the Japanese culture. I gained knowledge and experience of the company involvement and technologies within the nuclear industry: especially the advanced boiling water reactor technology and aspects that would play a part in the new Wylfa power station. “I am very grateful to the staff at the School of Electronic Engineering for their support, guidance and belief in me, especially to my tutor, Dr Iestyn Pierce, for his unconditional support and confidence in my academic abilities. I’m also indebted to Rhian from the Dyslexia Centre for her continued support during the past 4 years and developing and improving my literacy skills.